Shirah is an interdisciplinary social scientist, entrepreneur, and startup mentor who has studied and worked on 5 continents, traveled in more than 50 countries, and can communicate to varying degrees in 12 languages. She is currently a PhD Candidate at the Swiss Federal Institute of Technology – one of the top engineering schools in Europe – where she conducts research on the role of culture in shaping sustainably-minded entrepreneurs and lectures on entrepreneurship and technology commercialization. What do Management Consultant do? What does their work environment look like? Management analysts travel frequently to meet with clients. In 2016, about 1 in 4 worked more than 40 hours per week. How do you become a Management Consultant? Most management analysts have at least a bachelor’s degree. The Certified Management Consultant (CMC) designation may improve job prospects. What additional skills that they typically don’t teach in school do you need? Communication skills, organization, past job experience, testimonials, ability to go out and get clients on own. The median annual wage for management analysts was $81,330 in May 2016. Employment of management analysts is projected to grow 14 percent from 2016 to 2026, faster than the average for all occupations. Demand for the services of these workers should grow as organizations continue to seek ways to improve efficiency and control costs. US news rates a management consultant as # 16 in best business jobs which ranks them based on 5 categories ( salary, job market, future growth, stress, and work-life balance). With Statistician, actuary, and mathematician coming in 1st, 2nd and 3rd respectively. See the links below for more information on this week’s industry insights!! If you enjoy the flexibility of managing your own schedule are willing to hustle for several years to get your business off the ground… management consulting could be a great fit! [2:33] – Meet This Week’s Guest, Shirah Foy! [3:16] – Management Consultancy, Industry Overview. [7:19] – Mentor Industry Insights. [11:59] – How Shirah Got Started! [17:12] – The Value of Internships! [20:35] – A College Path… Through Europe! [29:40] – A Word From The Mastermind Community! [31:35] – An Average Day in the Life of a PHD Student. 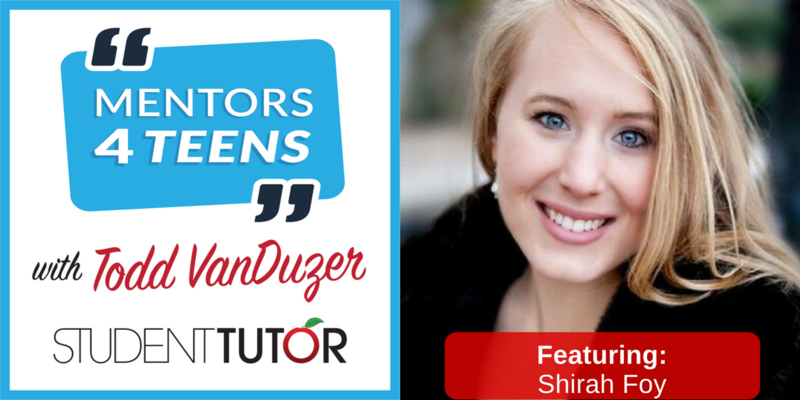 [35:30] – Shirah’s #1 Piece of Actionable Advice for Teens! [38:51] – Todd’s Recap and Key Points! [40:09] – Questions from the Student-Tutor Mastermind Students. [49:12] – Next Week Preview! Get Career Experience and Internships EARLY! Having the opportunity to explore career options early on will allow you to test drive the opportunity will allow you to see if you actually enjoy it! Try learning another language, or even study abroad! By forcing yourself to adapt, you will learn new skills and become more resilient overall! Travel or Take Opportunities to Study Abroad! These opportunities to study culture and learn another language can offer huge growth as a learner and candidate for potential career opportunities! More Information on this Week’s Industry Analysis! Connect With This Week’s Mentor! Connect with Shirah on Instagram! Are you interested in joining our community of proactive teens and parents for FREE? Step 1: Join our FREE college prep, scholarship, and career guidance Facebook group! Step 2: Register for our next FREE webinar to learn how to save thousands + set your teenager up career, college, and scholarship success!